A cyst on the forehead signifies that something is not right in your body. It is a sign of infection. It is a sac-like structure and its size varies. 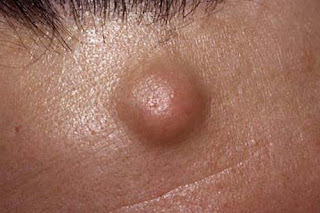 Large cyst can be a source of embarrassment. 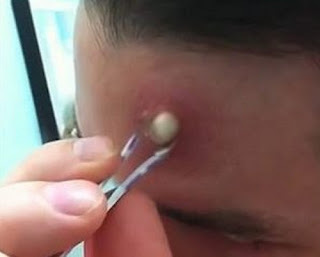 Sebaceous cyst – It is caused by a swollen hair follicle. It starts from the sebaceous gland, the moved to the surface of the skin, move deeper and multiple causing the formation of cyst. Milia – It is a small white bump commonly found on the face, especially on the cheeks, nose, lips, and forehead. It occurs when the keratin is trapped beneath the skin’s surface. Milia is common in babies, especially newborns and goes away on its own. However, milia in adults is linked with excessive use of steroid, burns, sun damage, and blisters from injury. Surgical wound - Cyst on forehead under skin can be caused by cuts and incisions in the skin. It could be secondary to surgical procedure or skin opening caused by draining of pus from skin lump. Hot Fomentation – It should be applied on the forehead after 24 hours of cold compress. It should be applied for at least a few minutes. The purpose of hot fomentation is to improve the circulation of blood and hasten healing. Hydration – You should drink plenty of water to help flush out the toxins from the body. Aside from water, you also need to increase your intake of natural fruit juices. The cost of removing cyst on the forehead varies from one doctor to another. There are a few considerations too such as the size and nature of the cyst. Large cysts cost more, especially if the cyst is infected. The cost ranges from $500 to $1,000. The cost is also affected by geographic location. If there are a lot of surgeons in the area, the cost fluctuates because there are a lot of competitors. When a cyst on the forehead becomes alarming?